A dog or puppy that’s full of energy can be quite exhausting to take care of sometimes. Fortunately, you can control the situation by providing your furry friend with quality dog toys. There are a number of toys you can give your pet, but in this article, we’re going to talk about the best dog puzzle toys on the market. First of all, you should never compromise the safety of your dog when buying an interactive toy. You have to choose a toy that is made using non-toxic materials. After all, he will spend most of his time playing with the toy using his mouth, so it’s only important that the toy is safe to put in the mouth. Another important thing to consider is that it should not contain a lot of tiny parts as they can only lead to choking hazards when your dog swallows them. It’s no longer surprising that some dogs aren’t as intelligent as the others. Hence, a single puzzle difficulty isn’t really possible due to the huge range of intelligence levels among dogs. Due to this, choosing an interactive puzzle toy that features adjustable difficulty levels is important. If your dog finds his toy too difficult, it’s very likely that he won’t be interested in it for long and will find other things to play with instead. Meanwhile, if it’s too easy, he’ll also quickly lose interest. Therefore, choosing one with the corresponding difficulty level is important for all interactive puzzle toys. Interactive dog toys are designed to challenge your dog’s thinking skills in exchange for a treat inside. However, if the toy is either too big or too small, it can no longer be challenging at all. For example, if your dog is too small for his toy, you might not be able to reach inside to get the treat. On the other hand, if it’s too small, there could be the likelihood of the toy pieces being swallowed by your dog, resulting in a choking hazard. To avoid these from happening, you have to pick an appropriately sized toy that corresponds to your dog’s size and breed. Since most interactive dog toys come with space where you can stuff some treats to encourage your dog, it only makes sense to pick one that’s relatively easy to clean. After all, you don’t want to feed your pet with rotten or moldy treats! Service and hunting dogs require problem-solving skills (well, all dogs need them to some extent). Puzzle toys entail activities that demand problem-solving skills. By giving your dog a puzzle toy, he will be able to enhance those skills. Dog puzzle toys are created based on the dogs’ instinct to search for food. That said, it also means that such toys can be used for portion control. As you’re going to put food inside, and also since they are designed to release those treats slowly, then you can deal with your dog’s overeating problem, if any. By prompting your dog to work to get food, you can essentially limit his consumption and even slow down his digestion to avoid abnormal spikes in his blood sugar. As a result, you can quickly and easily manage your dog’s weight. Exercise is important to keep your dog’s health in check. The same goes for mental exercise. The number of neurons that are activated in your dog’s brain for any given task can actually be beneficial for his mental health. There’s only one way to make that happen, and it’s by giving him with a variety of mental stimulation. The use of puzzle toys has been proven to improve dogs’ brain development simply because such activities can offer them enough mental stimulation. A puzzle toy is designed to let your dog get food inside by exerting effort. This concept is actually a good way to give your dog a fun and exciting way to exercise. You can do so by throwing the toy and let your dog run after it. It can also bounce so your dog can hop along. The best part about this toy is that it allows them to receive a reward whenever they play. Additionally, you can give them a fun way to exercise in the process. If you think your dog can’t suffer from boredom, then you’re absolutely wrong. Dogs can certainly get bored over time, especially if they’re left behind while you’re at the office doing your job. By giving them toys while you’re out can actually alleviate their boredom. Now, by adding some dog treats inside, you can surely keep your pet happy at all times. This one’s actually controversial, but it does make sense. This is owing to the fact that puzzle toys provide your dog with lots of mental stimulation. The higher mental stimulation there is, the lesser the chance of developing dementia in your dog. The reason for this is simple. By activating a huge amount of brain cells at the same time, electrical signals are transmitted properly. This keeps the neurons from undergoing degenerative changes considering that they’re used efficiently. With this, you’ll be essentially slowing down your dog’s symptoms of forgetfulness, especially during his senior years. If your pet’s no longer excited every time he plays his ball toy, then maybe it’s time to step up the game. The IQ treat ball from OurPets is designed so that even the laziest dog will be excited to play and exercise. Needless to say, it’s the leading treat ball you can find on the market. 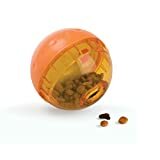 The ball is designed so that you can place treats inside of it which will be dispensed each time your dog plays with it. It also comes with adjustable difficulty levels, allowing you to make it more challenging once your dog gets better at solving it. The Trixie flip board is no doubt the most challenging puzzle feeder system there is. Compared to most treat dispensing toys, the flip board will require your dog to find out how to manipulate the covers in order to get the dog treat hidden inside. As the board comes with several partitions, each with its own cover, you can easily increase the difficulty by choosing which partitions will contain a treat. Also, the flip board is designed so that when your dog opens the covers in a wrong way, the treats inside won’t be spilled. Coming in an adorable appearance, this hide and squeak toy from Outward Hound is definitely interactive and super fun for your dogs. It comes with five holes where you can hide the treats along with squeaky squirrels that will add to the overall fun. However, if your dog became bored with the usual hide and seek, you can also play catch by simply throwing these plush toys around. 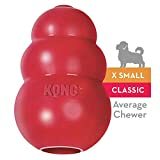 Kong offers some of the highest quality dog toys on the market, and this wobbler is just one of them. Aside from being durable, it’s also fun and interactive for your pet. Simply put a treat inside the toy, and you can give your dog a fun and engaging toy to play with. One of the best things about this toy is its simple design that comes with very few parts. This only means you can rest assured that it won’t pose any choking hazards to your dog. Another product from Trixie, this toy is designed especially for the intermediate gamer. It provides your dog with a fun and exciting way to exercise while giving him a bit more of a challenge. To use it, you simply have to place the treats inside the three beakers then cover them with a lid. Each of the covers has holes where the treats are dispensed when it’s been properly explored by your dog. There are also two sets of lids with varying patterns so you can easily adjust the difficulty level. Lastly, it has non-slip rubber feet to keep the toy in place while your dog explores it. 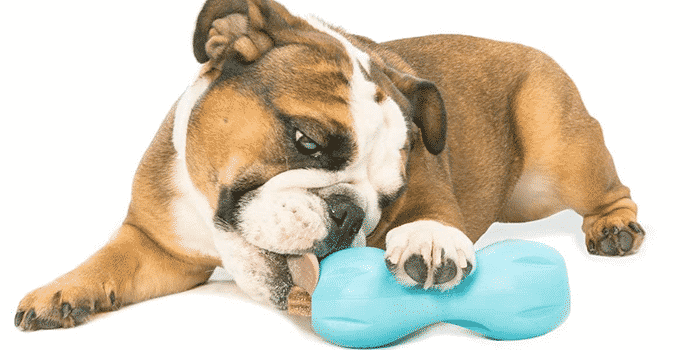 This dog brick treat puzzle toy from Outward Hound offers your dog with a considerable amount of mental and physical stimulation. Its fun and interactive design makes for an enjoyable playtime for your pet. Aside from that, it comes with 3 different treat feeding features, making it extremely versatile. It’s also very easy to clean. Simply wash it using soap and water then leave to dry. Rather than a challenging puzzle that requires a lot of problem-solving skills, the Snuffle mat from PAW5 is actually more of a scent game. Its sniffing mechanics make it ideal for use on dogs who are suffering from anxiety. By using this mat, your dog can get the benefits of using his nose and mind to look for treats. Basically, it’s a carpet that can be stuffed with treats. If you’re worried that your dog might be overeating, then you might want to consider this fun feeder from Outward Hound. In spite of its basic design, it’s actually a useful puzzle toy which offers your dog with some stimulation while slowing down his feeding times. With the fun feeder’s design, you can slow down your dog’s eating by up to 10 times slower. Aside from that, it also improves digestion by allowing your pet to forage for food from the mazes and patterns. Lastly, it’s made of a food-safe ABS plastic that contains no toxic chemicals. 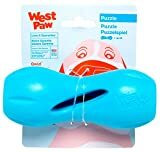 This interactive treat dispensing puzzle toy from West Paw also doubles as a chew toy. It’s made using durable materials that can easily withstand your dog’s bite force regardless of how strong a chewer he is. It features a very simple design but does a great job of making it a real challenge for your dogs to get the treats inside. There are slits located in the middle so your dog can smell the scent of the treats inside, further stimulating them to try and get those treats. Q: Do puzzle toys substitute exercising? A: Unfortunately, no. While puzzle toys are great for providing your dog with both mental and physical stimulation, exercising still remains important to keep your dog’s health in check. Therefore, you shouldn’t just rely on using puzzle toys for your dogs. You need to give them proper exercise too. Q: How to introduce my dog to puzzle toys? A: Your dog may find the concept of puzzle toys confusing, which is why you have to start easy and then gradually make the game harder as he starts to figure out how to play with his toys. You can start by placing it on the floor, allowing him to investigate it by sniffing. Once he starts showing interest, give him treats. After he gets the hang of it, you may then start placing treats inside. Q: Should I help my dogs with puzzles? A: Ideally, you want to help your dog get familiar with his puzzle toy at first. However, as he gets used to it and finally knows how to play with it, it’s best to just leave him and have him enjoy the fun. This way, he can get the stimulation that he needs while being rewarded in the process. Like what’s been said earlier, puzzle toys are based on dogs’ natural instincts to hunt for food. By understanding this, you can easily appreciate the benefits that puzzle toys can give your dog, not to mention you no longer have to wonder why they seem to love playing with them. When choosing the best dog puzzle toys, make sure you go for those that are appropriately sized for your dog and are made of non-toxic materials.